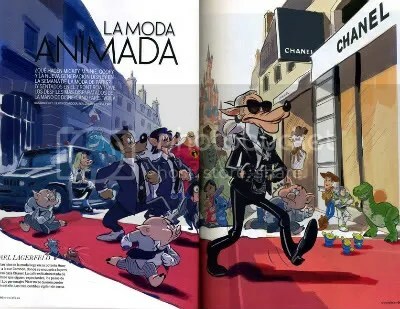 For the April 2010 issue of Elle Spain, illustrator Ulrich Schröder combined the classic Disney characters as some top designers along with other Disney characters in the background to include Tinkerbell, Peter Pan, the seven dwarfs, Lilo & Stitch, the Three Little Pigs, Toy Story, and more. 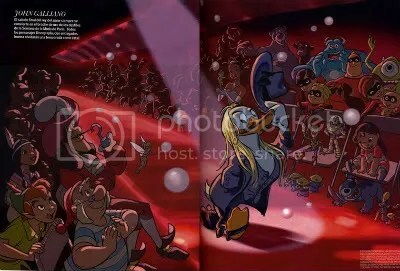 I’ve always been a fan of Disney and I love how they incorporated designers as the Disney characters. 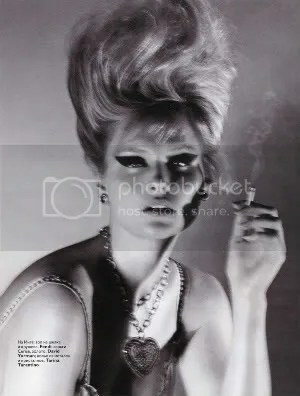 Infusing 1960’s glamour, 26-year-old Inga Eiriksdottir looks stunning behind the baby pink backdrop in designs by Fendi, David Yurman, Tarina Tarantino, Alexander Wang, Dolce & Gabbana, Incanto, Emilio Cavallini, Hermès, Jean Paul Gaultier, Patricia Field, Sonia Rykiel, Just Cavalli, Kiki de Montparnasse, Helen Yarmak, Leah C, Chanel, Rosamosario, Intimissimi, and Prada.